Taos children, who seem to have an endless supply of energy during all seasons, never lack local opportunities to have fun. Summertime calls for hiking, rafting and hot air ballooning, but winter also beguiles kids with a variety of activities, both indoors and outdoors. Taos is world-renowned as a preferred ski destination for adults. It also offers the charms of its snowy slopes to the little ones. 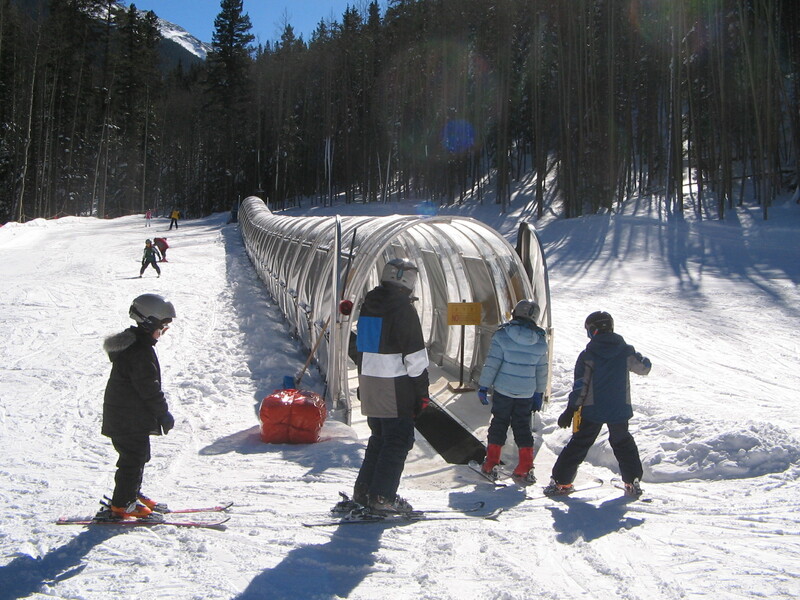 The Kids Center at Taos Ski Valley has developed a selection of programs for kids of all ages. It all starts with Bebekare (from 6 weeks to 1 year old). The Bebekare quarters are brightly lit rooms where children do art projects, which are displayed right there. “We do a lot of sledding,” said Bebekare supervisor Karrie Gallegos. “The kids also play with blocks, balls and cars.” Parents are welcomed to come by, nurse the kids or just peek in. They can ski right off the mountain and walk into the Kids Center. Kinderkare (from one to three years old) also offers indoor and outdoor activities. Nature walks are a favorite, said Gallegos. Kristi Vine supervises Junior Elite I (from three to seven years old, potty trained). Here children learn the basics of skiing and snowboarding, though snowboard instruction isn’t started until age four. “I have great a staff that makes it all work,” said Vine. Paco Highans, a Junior Elite I instructor, enjoys what he does for a living. “I am an eight-year old in a thirty-six-year-old body,” he said. “My biggest reward is when I see a kid who was terrified of snow the first day making turns and getting really excited about the sport.” They have a ceremony to introduce their students to Junior Elite II (from eight to fifteen years old) where the learning pace is much faster. More than just a store, better than a playground, this is an enchanted space where one can find pirate treasures, music boxes, a wishing well, an ever-changing diorama… and plenty of giggles. There are also guided classes, all of which are free. Ballet for Preschoolers is a real favorite. As for the musical activities, Twirl provides a wide range of musical instruments that include rhythm sticks, drums, cymbals, shakers, spoons, and bells, all available for free play. For the Family Music Classes, Abbate-Shriver leads singing and instrument playing and invites children and parents to join in. She also includes scarves, ribbons and puppets in the class to encourage movement and imaginative dance. The Harwood Museum of Art caters to the artists of the future. Its Saturday Arts for Families program presents Art & Movement Classes for Kids in February 5th, 19th and 26th , from 10 a.m. to 11:30 a.m. Classes are free and include a yoga session for kids, with mats provided. The yoga sessions, combined with art activities, will be led by artist and Jivamukti yoga teacher Jayne Schell at the Agnes Martin Gallery. Art in Museums, another free program sponsored by the Museum Association of Taos, is designed for preschoolers and younger children. Every Wednesday at 11:30 a.m. children, as well as parents and care-givers, can meet to enjoy a short story and age-appropriate art activities. It rotates monthly to different Taos Museums. In February it will be hosted at the Millicent Rogers Museum. So there are plenty of choices…from skiing and snowboarding to staying indoors with a Twirl toy and a stuffed puppy, to museum hopping. One thing is for sure—Taos kids will not get bored this winter. Twirl is located at 225 Camino de la Placita, opposite Our Lady of Guadalupe Church and next to the John Dunn parking lot. Next Post Hide from the light or frame it right? How to take proper care of your artwork.